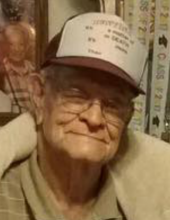 Lawrence Morrison 84 of Rogers, passed away surrounded by his family January 29, 2019 in Bentonville. He was born September 26, 1934 in Garfield the son of John Oliver and Lourine Clemetine Marler Morrison. Lawrence worked in Danville for thirty years at a chicken farm and for Dr. Pepper Company of Tulsa. He was a member of the Lakeside Baptist Church and served in the United States Army. He is preceded in death by his wife Retha Earls Morrison and his son John Douglas Morrison. He is survived by his daughter Janet Morrison Francis of Rogers; his sisters Dorothy Ocheltree and Connie Prophet both of Rogers; two granddaughters Rachel and Katie McClure, and several nieces and nephews. To send flowers or a remembrance gift to the family of Lawrence Morrison, please visit our Tribute Store. "Email Address" would like to share the life celebration of Lawrence Morrison. Click on the "link" to go to share a favorite memory or leave a condolence message for the family.